Microsoft today introduced a new games hub which connects major social gaming portals. The Microsoft Game Hub is a portal that combines MSN Games, Bing Games and Windows Live Messenger which Microsoft aims will bring in a good chunk of the 99 million people who play online games every day. Microsoft said that adding the messenger gave it the ability to enhance its gaming experience with the social aspect to it. The percentage of online gamers has increased over the last year from 40% to 50% in 2010. Microsoft’s Michael Wolf, senior marketing manager for Xbox said, “With today’s announcements, we’ve made it easier to find and play the games you love while connecting to the people who matter most to you. We’re driving that experience across multiple platforms so millions of players can share their experiences with their social circles”. 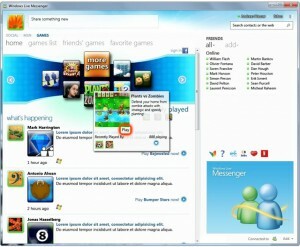 Microsoft said that games tab will integrate with Facebook allowing constant updates and score updates. The service will launch in the US, UK, France, Spain, Canada, Mexico, Italy, Brazil, Germany, the Netherlands, and Turkey. More markets will be added later in this year. Microsoft is offering 35 titles today including some hits like Cubis 2, Super Stacker and Plants vs Zombies. All games are playable on either of the platforms with ability to pause and continue on another.